The Garden of Peace Memorial, located in Boston, Massachusetts, is essentially the result of efforts led by the late Paul R. Rober, Sr., who was looking for a way to memorialize the life of his murdered son, Paul R. Rober, Jr. A paraplegic by birth, Rober’s son was last seen alive at a Dunkin’ Donuts coffee shop on October 11, 1986, just shortly before he was beaten severely, strangled with a rope, and buried in a shallow grave that had been hastily dug in a heavily wooded area not too far from the point of his disappearance. Desperately seeking an avenue through which he could manage his grief, Rober was instrumental in the formation of the Boston chapter for Parents of Murdered Children (POMC), an organization first established in 1978 by Reverend Robert Hullinger and his wife, in response to the overwhelming sorrow they associated with the murder of their 19-year-old daughter, Lisa Hullinger. There are now over 60 chapters located across the United States, with a total membership of over 100,000 survivors. POMC is instrumental in providing “the on-going emotional support needed to help parents and other survivors facilitate the reconstruction of a ‘new life’ and to promote a healthy resolution” to the intense grieving process and legal dilemmas that are associated with the loss of a loved one through murder. Paul Rober, Sr., who passed away in 2002, became a vigorous promoter of non-violence, peace and the creation of a memorial that would honor the victims of murder – even gaining the notice of Massachusetts Governor William Weld in the process. 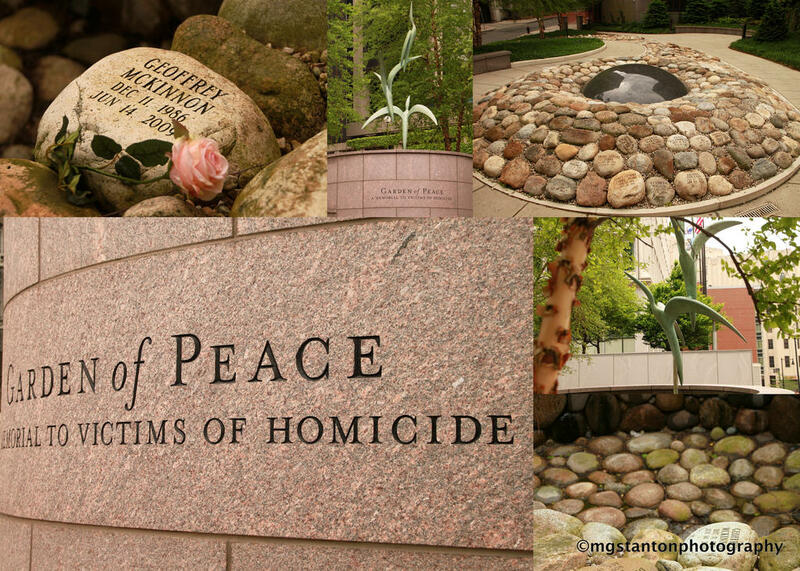 Along the way, Rober met Beatrice Nessen, who assumed the leadership role when he passed away – forming the expansive coalition of homicide survivors, elected officials, interested business leaders, and victim service benefactors that brought the memorial to the point of reality. The Garden of Peace coalition turned to the Harvard Graduate School of Design when choosing the designer for their monument, selecting Catherine Melina – who was at that time a student in the program, but who has since achieved notoriety as a partner in the Melina/Hyland Design Group of Cambridge, Massachusetts. The end result came through a unique combination of politics, promotion, and community benevolence – eventually involving even the state legislature. In 2000, a bill called for the renovation of the Saltonstall State Office Building, to occur under the auspices of the Mass Development Finance Agency – which is now known as Mass Development. The bill demanded that the renovation include the Garden of Peace as part of the designs, but Mass Development went one step further and donated $200,000 toward the construction of Rober’s dream memorial. Dedicated on September 24, 2004, the Garden of Peace Memorial is a plaza nestled between two buildings located on Somerset Street in Boston. Running through the middle of the plaza is a dry streambed – symbolizing an absence of life-giving water, and thereby indicating the heartrending loss in lives that has transpired through violence. Lining the streambed are stones that bear the names, birthday and date of death for each murdered victim to whom the memorial is dedicated. Each stone is unique in appearance, just as the life of each human being is inimitable in nature. The dry streambed emanates from a partially buried granite lens entitled “Tragic Density,” intended to denote the intense grief imbedded in the hearts of those who have lost a loved one to murder. The plaza also includes cascading water and a symbolic pool, from which a 17 foot high sculpture of three ibises rises toward the sky, transcending anguish, pain, grief, and anger. Entitled Ibis Ascending, this sculpture is the work of artist Judy Kensley McKie, a graduate of the Rhode Island School of Design who lost her only son, Jesse, to an indiscriminate act of violence. 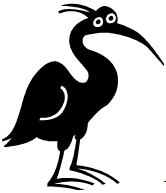 She chose the ibis as the subject of her artwork due to its symbolic connection to healing and resurrection in Egyptian mythology. Replicas of the sculpture can be purchased through a donation of $1500 to the Garden of Peace. Likewise, the names of victims can be added to the memorial for the sum of $100, which is paid through an application process accessible at the website. Between September of 2001 and September of 2011, approximately 30 U. S. citizens have died in terrorist incidents that took place within the geographic confines of the United States. During the same timeframe, roughly 116,000 U. S. citizens lost their lives in gun-related murders – and within that statistic, over 46,000 white Americans were murdered by other white Americans, thereby indicating that the issue of murder is not specific to non-white Americans. There is no question as to the need for non-violence and peace in the world when it comes to terrorism, but this peace needs to take hold within the geographic boundaries of the United States and permeate the very fabric of our society, which has grown far too violent. The Garden of Peace is a reminder of this fact, and it is an idea for commemoration that could easily be adapted to the recognition of those that have died in terrorist attacks – which are less numerous but of even graver concern for the future of the world. Terrorism reaches beyond the realm of murder into the insane darkness of international violence and intimidation that is conducted in the name of political and religious aims. Given that these intentions could likely include nuclear obliteration and genocide one day, the need for a monument that carries the same message as the Garden of Peace is obvious. Obvious, but unfortunately overlooked in the United States at this time – at least in the minds of those that support this website. This entry was posted in Posts for the Cause and tagged Architecture, Beatrice Nessen, Boston, Boston Peace Garden, Garden of Peace Memorial, Harvard Graduate School of Design, Ibis Ascending, monuments to victims of terrorism, Murder, Parents of Murdered Children, Paul R. Rober, peace, Reverend Robert Hullinger, terrorism, terroristic violence, Tragic Density, victims. Bookmark the permalink.